Alkali Ike and his auto. Alkali Ike was a popular early silent character played by Augustus Carney. This movie was shot in a remote location not far from San Francisco and produced by Essanay. It was so popular that it was re-released 2 years later where it out-grossed its initial run. 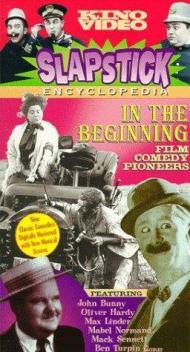 This is a comedy western short. It begins with Alkali Ike and Mustang Pete helping a very tall woman wash dishes. They get into an argument, even drawing pistols over who will carry the wash pan outside to dump. Later Alkali Ike asks her to go for a horse back ride. Mustang Pete shows up with a horse and buggy. The woman goes with him instead. A city feller shows up with a car for sale or trade. Alkali Ike trades his horses for the auto. He catches up to his girl in the buggy and shows off his new ride. This fickle woman then gets in the car with our hero. Of course things don’t go well. When the car stalls Ike gets out to have a look and the car begins rolling down a hill with his girl screaming for help. She eventually crashes and goes over the dashboard and into the dirt. When Ike finally catches up to her, she throttles him and then spanks him. Fade to black. The rustic outdoor scenery is interesting to see. I wonder what the area where this movie was shot looks like today. It’s hard to believe this movie was such a big hit in its day. I guess times were much simpler then. It was directed by the first cowboy star Broncho Billy Anderson. Augustus Carney buys an auto in Alkali Ike's Auto. Augustus Carney was a British born, early silent film star. This short was the first of over 50 shorts he would appear in as Alkali Ike (or Universal Ike as the character would be known when he switched studios). He began his career in Vaudeville, but transferred to moving pictures as did many stars of the day. His career was short lived though when he began to make increasingly large wage demands. Between 1909 and 1916, he would appear in 161 shorts. He died just four years after his film career ended at the comparatively young age of 50. This short is, as Patrick described, very simple and a little silly. 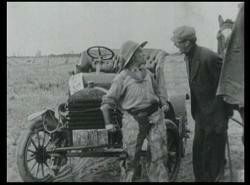 Two cowboys argue over a not very attractive woman, with one of them buying a car in an attempt to impress her. It's a rather crude short, with one "trick" to it when the woman ends up in a runaway car. You can tell by the movement of animals as the car passes how they sped up the film to make it appear as if it were moving faster than it really was. I agree Patrick. 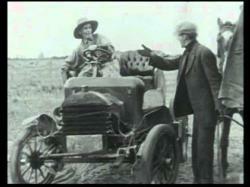 Times must have been very simple for this to be considered entertainment, but then it was being shown to audiences who were probably as impressed with seeing an automobile as the cowboys in the film are. Were the cowboys trying to impress the woman as a love interest or was she their mother? They certainly want her attention but her looks do not warrant such efforts. The spanking at the end seems quite maternal. It would certainly have been odd to have had a love interest spank a suitor. Another odd thing is the way both cowboys carry their guns in holsters that hang from their belts right in front of their crotch. I am fairly sure it was not intentionally sexual, but every time they went for their guns I thought I was watching a Michael Jackson music video. 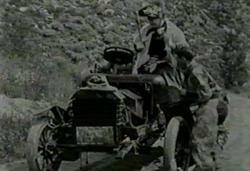 One reason why this film may have been so popular at the time is that it shows cars as dangerous. The woman ends up crashing in the car and then gets back into the carriage. If you were too poor to buy a car, you may have seen this film as a knock on those who do. Either way, Alkali Ike's Auto is worth a glance, but no more.